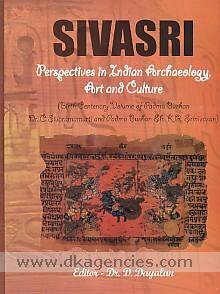 Sivasri perspectives in Indian archaeology, Art & Culture! It is a miscellany of scholarly essays covering varied aspects of Indian prehistory, Harappan sites, Buddhist studies, art history, historical monuments, sculptures, temples, temple structural types, Puranic myths, inscriptions, and iconography ISBN 9788173201332, DK-227593 Sivasri perspectives in Indian archaeology, art & culture birth centenary volume of Padma Bushan Dr. C. Sivaramamurti and Padma Bushan Sh. K.R. Srinivasan editor, D. Dayalan. Delhi Agam Kala Prakashan, 2013.